Call A to Z Entertainment, Inc. today for free information about how to hire or book country musician Tim McGraw. We are your best booking agent and top talent agency for hiring country music singer Tim McGraw! We book or help you hire any live professional entertainment you want, to include – country musicians, country singers, and country cover and tribute bands. This dedication to honesty and integrity has helped make McGraw not just a country music superstar, but one of the biggest names in all of music today. 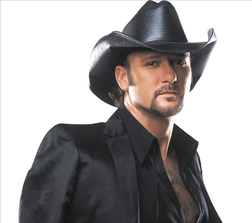 In his record-shattering career, McGraw has sold over 40 million albums, and dominated the charts with 30 Number One singles. Since the release of his debut album in 1993, he has won three Grammys, 14 Academy of Country Music Awards, 11 Country Music Association Awards, and 10 American Music Awards, while simultaneously maintaining a parallel career as a successful actor. Now, with the release of SOUTHERN VOICE—his tenth studio album, and his first in over two years—Tim McGraw is extending his achievements even further. Recorded with his longtime producer, Byron Gallimore (Faith Hill, Sugarland), the disc’s twelve songs represent a new level of depth and intensity for the singer from the small town of Start, Louisiana; they tell unforgettable stories of lives lived and lessons learned, and reveal a man staring down what it means to be a father, a husband, a Southerner. Among the territory explored by McGraw on SOUTHERN VOICE is aging and mortality (on songs like “If I Died Today” and “Forever Seventeen”) and the relationships between parents and children (“You Had to Be There,” “I Love You Goodbye”). These concepts aren’t new for the man behind “Live Like You Were Dying,” but they continue to add weight and perspective over time. Of course, not all of SOUTHERN VOICE is such serious business. The country album’s first single, “It’s a Business Doing Pleasure With You,” is a cranked-up lament about the financial tolls of romance. The title track, meanwhile, is nothing less than a modern anthem, an irresistible celebration of the joys and contributions of the American South. One of the world’s most beloved live performers (on their historic 2006-2007 Soul2Soul tour, he and his wife, Faith Hill, performed for over two million fans), Tim McGraw will support SOUTHERN VOICE with an extensive tour in 2010. First, though, he needs to fulfill some commitments for his career on the big screen, including a co-starring role in The Blind Side, with Sandra Bullock. All of Tim McGraw’s experiences—as a singer, an actor, a husband and father—culminate in his work on SOUTHERN VOICE. These songs offer the perspective of a man who has lived a full life and always stayed just a bit under the radar while steadily racking up multi-platinum honors (“I like going out and quietly slaying dragons,” he says.) He has recorded some of the hits that define country music over the last fifteen years—classics like “Just To See You Smile,” “I Like It, I Love It,” and “It’s Your Love” (which was voted CMT’s top video of all time)—but he still seems to operate entirely on his own terms. “I don’t look at how I fit into the industry, into the puzzle of other artists,” says McGraw. “I look at how can I get better and where I’m going. I’m competitive and I want to win, but at the same time, I don’t even know what the competition is doing. I just want to get better, period. We can help you book or hire any country musicians, country music singers, or country bands. We’re your best booking agency and agent for hiring Tim McGraw, so call 1-888-655-4575 today. We are not the exclusive agency for any corporate artists on this site.